How can Earth observations improve our understanding of drought and the underlying hydrologic components related to this climatic extreme? 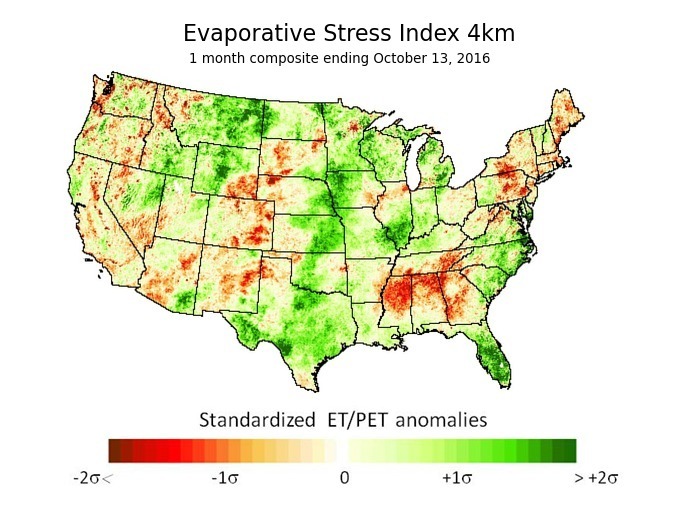 The suite of new satellite observations and tools that have emerged over the past decade allow evapotranspiration, precipitation, soil moisture, and vegetation health to be analyzed and monitored, providing a more comprehensive view of drought conditions. What is the role and response of climate-vegetation-water interactions across the landscape to changing environment conditions and how does it affect agricultural and natural resource sustainability? 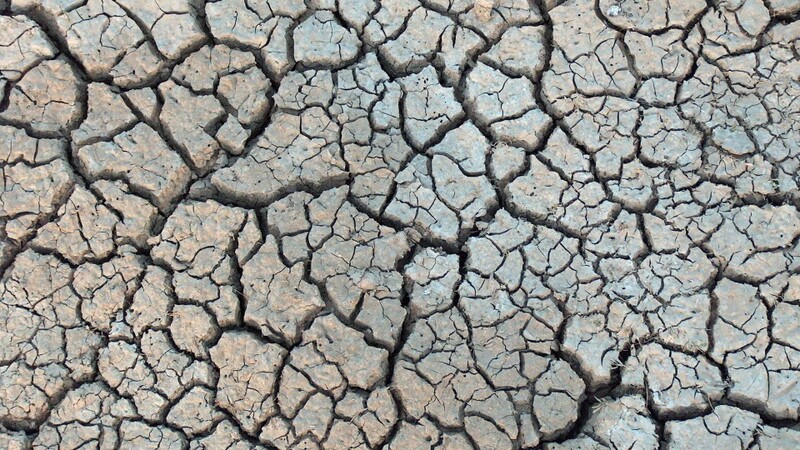 Drought is a complex, multi-faceted natural hazard. An effective response requires many types of information collected at various spatial and temporal scales. Satellite remote sensing can fill in the information gaps of traditional field observations, providing a more complete view of drought dynamics. CALMIT scientists investigate the use of satellite observations to characterize various drought-related components of the hydrologic cycle to develop a more complete view of drought conditions. Research aims to improve drought monitoring and early warning through the development of satellite-based remote sensing methods to map and monitor evapotranspiration, soil moisture, and vegetation health. The research is highly interdisciplinary including geography, climatology, hydrology, agronomy, ecology and social science. The Center's work spans the continuum of basic research, applied research, and practical application with the goal of providing actionable information for more effective agricultural, water, and other natural resource management in the face of drought. CALMIT maintains a strong research partnership with the National Drought Mitigation Center and leading remote sensing scientists and institutions with projects spanning the world. Image: 1-km QuickDRI map showing intense short-term drought conditions across much of the United States as the severe 2012 drought event emerged. 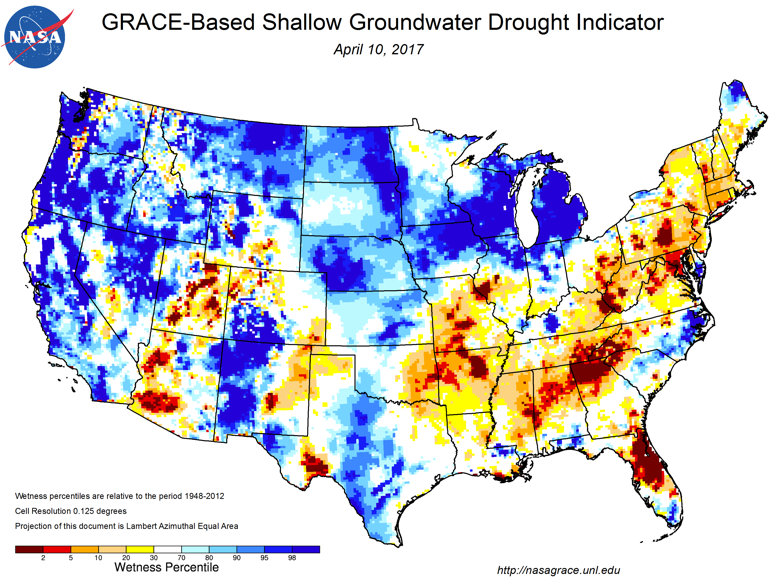 Image: GRACE shallow groundwater indicators depicting drought conditions in parts of the southeastern U.S. in April 2017. Image: ESI map with a 4-km resolution for the continental U.S. for October 13, 2016. Wardlow, B.D., M. Anderson, C. Hain, W. Crow, J. Otkin, T. Tadesse, and A.AghaKouchak. 2017. 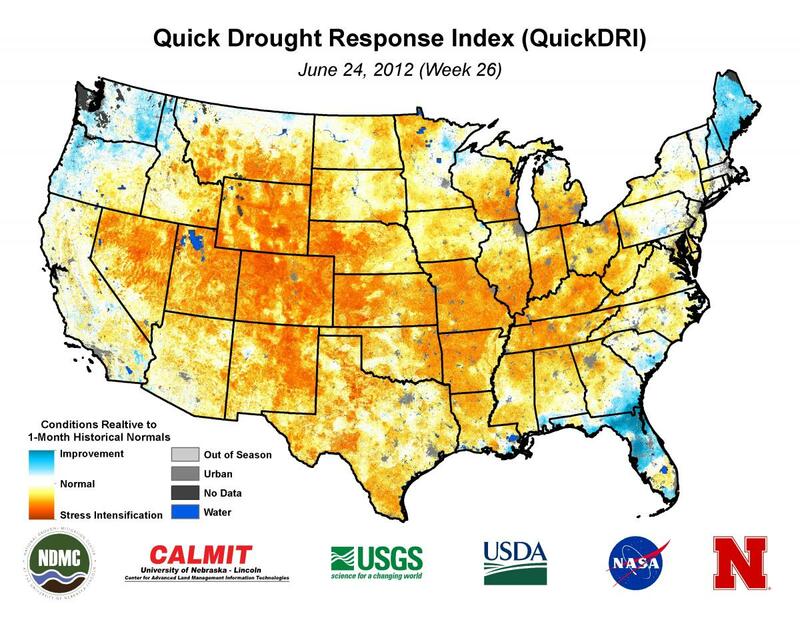 Advancements in Satellite Remote Sensing for Drought Monitoring. Chapter, Drought and Water Crisis, 2nd Edition. Boca Raton, FL:CRC Press, in press. Wardlow, B.D., M. Anderson, T. Tadesse, C. Hain, W. Crow, and M. Rodell. 2015. Remote sensing of drought: emergence of a satellite-based toolkit for the United States. Chapter 15, Remote Sensing Handbook” Vol. III: water Resources, Disasters, and Urban: Monitoring, Modeling, and Mapping, ed. P. Thenakenbail, Boca Raton, FL:CRC Press, 367-399. Wardlow, B.D., M.A. Anderson, J. Sheffield, B. Doorn, J.P. Verdin, X. Zhan, M. Rodell. 2012. Future opportunities and challenges in remote sensing of drought. In Remote Sensing of Drought: Innovative Monitoring Approaches, eds. B.D. Wardlow. M.A. Anderson, and J.P. Verdin, Boca Raton, FL:CRC Press, 389-409. Hayes, M., M. Svoboda, B.D. Wardlow, M.C. Anderson, and F. Kogan. 2012. Drought monitoring: historical and current perspectives. In Remote Sensing of Drought: Innovative Monitoring Approaches, eds. B.D. Wardlow. M.A. Anderson, and J.P. Verdin, Boca Raton, FL:CRC Press, 1-22. AghaKouchak, A., A. Farahmand, F.S. Melton, M.C. Anderson, J. Teixeira, B.D. Wardlow, and C.R. Hain. 2015. Remote sensing of drought: progress, challenges, and opportunities. Reviews of Geophysics 53:452-480. Tadesse, T., M. Haile, G. Senay, C. Knutson, and B.D. Wardlow. 2008. Building integrated drought monitoring and food security systems in sub-Saharan Africa. Natural Resources Forum 32:265-279. Tadesse, T., B.D. Wardlow, G.B. Demisse, Y.A. Bayissa, C. Champagne, T.A. Hadwen, and J.F. Brown. 2016. Building the Vegetation Drought Response Index for Canada (VegDRI-Canada) to monitor agricultural drought. GIScience and Remote Sensing, in press. Tadesse, T., B.D. Wardlow, J.D. Brown, and K. Callahan. 2015. Assessing the vegetation condition impacts of the 2011 drought across the U.S. Southern Great Plains using the Vegetation Drought Response Index (VegDRI). Journal of Applied Meteorology and Climatology 54(1):153-169. Wardlow, B.D., T. Tadesse, J.F. Brown, K. Callahan, S. Swain, and E. Hunt. 2012. 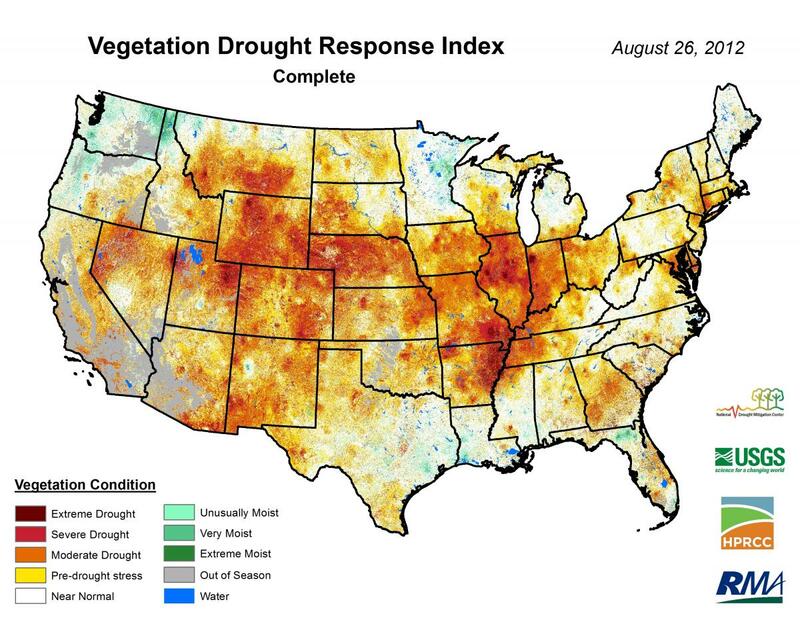 The Vegetation Drought Response Index (VegDRI): an integration of satellite, climate, and biophysical data. In Remote Sensing of Drought: Innovative Monitoring Approaches, eds. B.D. Wardlow, M.A. Anderson, and J. Verdin, Boca Raton, FL:CRC Press, 51-74. Swain, S., B.D. Wardlow, S. Narumalani, T. Tadesse, and K. Callahan. 2011. Assessment of vegetation response to drought in Nebraska using Terra-MODIS land surface temperature and normalized difference vegetation index. GIScience and Remote Sensing 48(3):432-455. Tadesse, T., B.Wardlow, M. Hayes, M. Svoboda, and J. Brown. 2010. The Vegetation Outlook (VegOut): a new method for predicting vegetation seasonal greenness. GIScience and Remote Sensing 47(1):25-52. Gu, Y., E. Hunt, B.D. Wardlow, J.B. Basara, J.F. Brown, and J.P. Verdin. 2008. Evaluation and validation of MODIS NDVI and NDWI for vegetation drought monitoring using Oklahoma mesonet soil moisture data. Geophysical Research Letters, doi:10.1029/2008GL035772. Brown, J.F., B.D. Wardlow, T. Tadesse, M.J. Hayes, and B.C. Reed. 2008. The Vegetation Drought Response Index (VegDRI): a new integrated approach for monitoring drought stress in vegetation. GIScience and Remote Sensing 45(1):16-46. Otkin, J.A., M.C. Anderson, C. Hain, M. Svoboda, D. Johnson, R. Mueller, T. Tadesse, B. Wardlow, and J. Brown. 2016. Assessing the evolution of soil moisture and vegetation conditions during the 2012 United States flash drought. Agricultural and Forest Meteorology 218-219:230-242. Otkin, J., M. Shafer, M. Svoboda, B. Wardlow, M.C. Anderson, C. Hain, and J. Basara. 2015. Facilitating the use of drought early warning information through interactions with stakeholders. Bulletin of the American Meteorology Society (BAMS) 96(7):1073-1078. Tadesse, T., B. Wardlow, and M. Hayes. 2008. The application of data mining for drought monitoring and prediction. Data Mining Applications for Empowering Knowledge Societies, New York, NY: Idea Group Publishers, 280-291. Anderson, M.C., C. Hain, B. Wardlow, A. Pimstein, J.R. Mecikalski, and W.P. Kustas. 2011. Evaluation of a drought index based on thermal remote sensing of evapotranspiration over the continental U.S. Journal of Climate 24:2025-2044. Hunt, E.D., M. Svoboda, B. Wardlow, K. Hubbard, M. Hayes, and T. Arkerbauer. 2014. Monitoring the effects of rapid onset of drought on non-irrigated maize with agronomic data and climate-based drought indices. Agricultural and Forest Meteorology 191:1-11. Anderson. M.C., C. Hain, J. Otkin, X. Zhan, K. Mo, M. Svoboda, B. Wardlow, and A. Pimstein. 2013. An intercomparison of drought indicators based on thermal remote sensing and NLDAS-2 simulations. Journal of Hydrometeorology, 14:1035-1056. Nghiem, S.V., B.D. Wardlow, D. Allured, M.D. Svoboda, D. LeComte, M. Rosencrans, S.K. Chan, and G. Neumann. 2012. Microwave remote sensing of soil moisture – science and applications. In Remote Sensing of Drought: Innovative Monitoring Approaches, eds. B.D. Wardlow. M.A. Anderson, and J.P. Verdin, Boca Raton, FL:CRC Press, 197-226. Aegerter, C., J. Wang, C. Ge, S. Irmak, R. Oglesby, B. Wardlow, H. Yang, J. You, and M. Shulski. 2016. Mesoscale modeling of the meteorological impacts of irrigation during the 2012 Central Plains drought. Journal of Applied Meteorology and Climatology, in press. Zambrano, F., B. Wardlow, T. Tadesse, M. Lillo-Saavedra, and O. Lagos. 2017. Evaluating satellite-derived long-term historical precipitation datasets for drought monitoring in Chile. Atmospheric Research 186:26-42. Wang, J. A.L. Kessner, C. Aegerter, A. Sharma, L. Judd, B. Wardlow, J. You, M. Shulski, S. Irmak, A. Kilic, and J. Zeng. 2016. A multi-sensor view of the 2012 Central Plains drought from space. Frontiers in Environmental Science 4:45. doi: 10.3389/fenvs.2016.00045. Albright, T.P., A.M. Pidgeon, C.D. Rittenhouse, M.K. Clayton, B.D. Wardlow, C.H. Flather, P.D. Culbert, and V.C. Radeloff. 2010. Combined effects of heat waves and droughts on avian communities across the conterminous United States. Ecospheres 1(5): DOI:10.1890/ES10-0057.1. Albright, T., A. Pidgeon, C. Rittenhouse, M. Clayton, C. Flather, P. Culbert, B. Wardlow, and V. Radeloff. 2010. Effects of drought on avian community structure. Global Change Biology doi:10,1111/j.1365-2486.02120x.